The day before yesterday i wanted to get some meds that the ashram pharmacy doesn’t carry, another option was to go to the one in the nearby village of Vallikavu. This is an activity i do not enjoy. It ranks right up there with going to the dentist! I usually get zapped by the heat and i find the noise and traffic exhausting. Mind you, there is little traffic on this road but it is very narrow and between the steady flow of auto rickshaws, motorcycles, trucks, buses and cars, as well as other pedestrians and occasional bicycles it gets very crowded real fast! It isn’t that far to walk but with the heat and humidity the distance often seems endless. I decided to go around 10:30 in the morning, before it got too hot. I geared myself to climb up the steps to the bridge and across the backwaters. I hoped there would be a rickshaw available on the other side to take me to the center of the village and back. This is one of the uncertainties of life at the ashram that is challenging for me. On some days there can be five or more rickshaws waiting for customers and on other days zeeeero, zip, nada. As i walked I vaguely noticed passing some orchids on my right. “Orchids, hmmm cool, reminds me of Maui” i thought as i kept walking. “Whoa, stop” called out the familiar inner voice. I hesitated. I had a plan, somewhere to get to, sooner than later. An activity i didn’t particularly enjoy doing awaited me, and i wanted to be done with it! I felt a shadow fall behind my eyes and over my heart. A sense of sadness, of loss. “This is one of the moments when you can choose to create a memory that is sweet, without regret” Said the voice softly. “You’ll be okay”, she added reassuringly. I heard gentleness and care in her tone. I turned and walked toward the orchids. I stood in front of them and felt my whole energy shift. It was like magic. My body relaxed as i stood there looking at them. At first they were still, and then they danced with the light breeze. Que bellas las orquídeas, que preciosas! 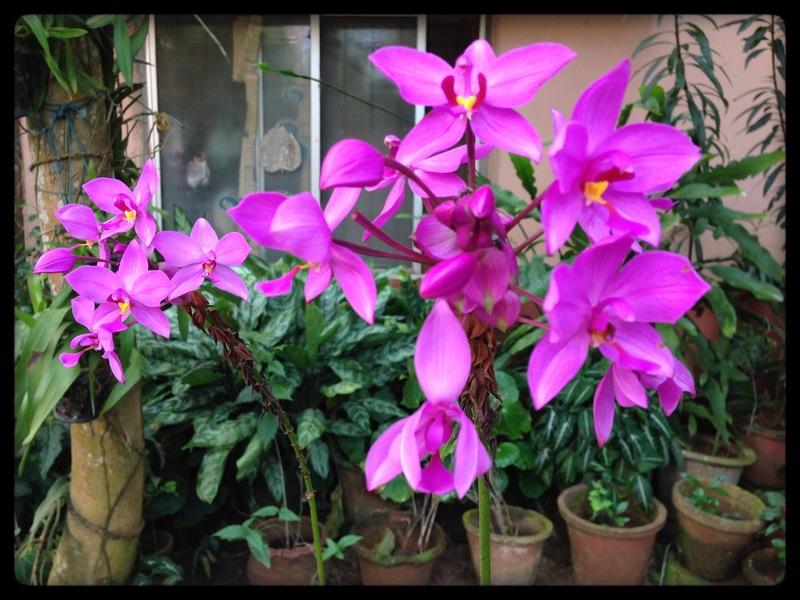 (How beautiful the orchids, how precious!) Then i saw the one facing me. She had a yellow heart and took my breath away. I took out my phone and looked at these orchids through the camera lens. Everything else disappeared. My mind went quiet and my breathing slowed down. In that moment there was no place i needed to get to, no more heat, no more bridge, no more traffic. Just a completely still, peaceful moment. I love this post. It has a very important message. It also has similarities to the post that I am going to write next, but with a different outcome. I didn’t go to Vallikavu for many years but have had a need to go several times over each of the last few Amritapuri visits. I really enjoy the hustle and bustle of the town. And once I discovered the new bakery also has ice cream sundaes going to Vallikavu became a highlight! Maybe after an experience like the one you described here going to town occasionally will become an adventure rather than something you dread. A beautiful post and photos. I love orchids and your thoughts. 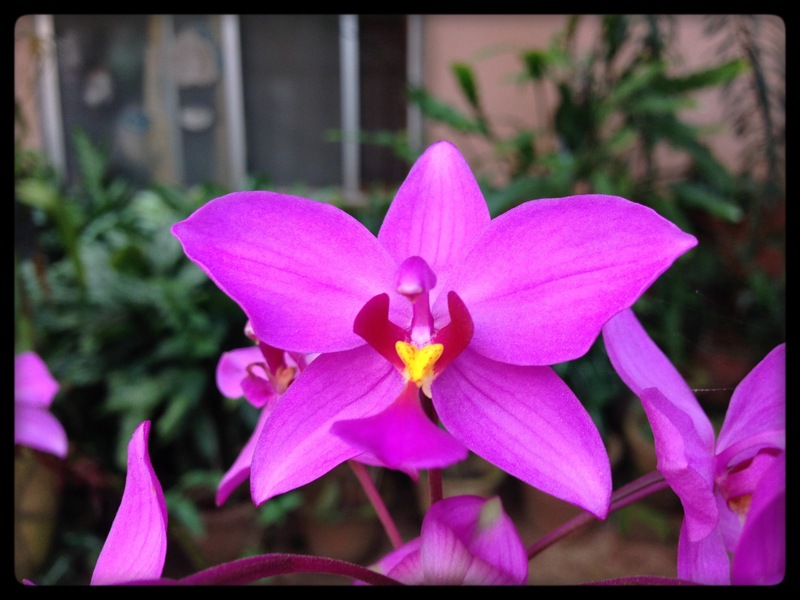 Thank you for sharing your enjoyment of this post and your love of orchids.